FIFO…. Some people get it and some people don’t. This is all I can say when reflecting on the different reactions from our family and friends when we said Furious D (my husband – herein known as FD) was going into mining. A few times we were met with looks of amusement (those who knew my husband best) but mostly shocked faces. After all FD was not, with a capital ‘N’ mining material. His background was in sales, that was sitting in a corporate office wearing a corporate suit selling corporate goods – you get the picture, a clean cut and shaven ‘suit’. His morning ritual for getting ready for work was all I can describe as ‘highly polished’. I must also mention here because it is one of my favourite things about FD is that he is a magician, no not a musician, a magician he is pretty darn good at it. A bad business decision saw us move back home to Australia with a thirteen year old son, no car, no house, no money and me 35 weeks pregnant. We saw no choice but to follow the long line at the airport of men and women wearing hi-viz shirts. Our family were supportive, our friends were a mixed bag of “Well you gotta do what you gotta do” to “I can’t believe FD is going to sacrifice his family to make a quick buck”. Sacrifice!! Like we were going to tie our son and new born up at the stake and present them to the Gods of Wealth. Despite our worries we had to do this to get back on track and feel secure financially and so we said we would support each other and commit to making it work. There would be no phone calls while crying long sad I miss you’s , I hate this life, I want you home or I want to come home , we needed to be strong and look at it as a means to an end, easy… right?? FD’s first job as a mining greenie (I am talking the greenest of green here) was in underground. My first reaction was please please don’t call every night and tell me about how far underground you went (geeze thinking back my support waivered in the first week, thankfully FD understood as I am seriously claustrophobic and I just wanted to think of him in a wonderfully safe environment with happiness and sparkles all around). Reality was he worked hard, really really hard. He pulled kilometres and kilometres of rods and put up with underground temperatures I could only imagine, he told me he got seriously dirty (thank God I did not see those clothes on my laundry floor) and he got paid pretty well, he did not once complain. Meanwhile I was focusing on getting into a routine with our teenage son and our little girl and we started our FIFO life with equal parts of enthusiasm and blind ignorance. This was going to be it for the next two or three years. Fast forward Nine years – NINE years!!!!! So there he is, in Karratha, and here I am in Brisbane, 5554 kilometres away from each other, sometimes it feels like a million bactrim buy kilometres away. I swear that distance has tortured me many times throughout the seven years. When the household has been taken over by chicken pox, influenza, broken bones and gastro all of which seems to visit our house on the same FIFO roster FD is on. Only on one occasion when I myself got really sick did I need extra support of my friends and family and boy was I overwhelmed with emotion when my dearest friends took the reins and did school drops and extended play dates and mum took three days off work to look after me. FD was concerned but couldn’t get home and when he did come home I was miraculously cured and he was like “so what was all the fuss about”. I opted for the ‘silent treatment’ that break. Fly out nights are horrendous, not only for jockeying for position along with what feels like every other FIFO worker getting dropped off at the airport but the emotions from our little girl who over the years has gone from painfully sad good-byes where we are all blubbering to see ya next time Dada – be safe. ‘Next time’ is two weeks’ time, when FD will fly home for one week (which is only five days due to flying time) where we will have to be super quiet for the first couple of days as he comes off night shift and tries to catch up on sleep and adjust again to a different time zone. FD grieves the lack of time he has had to see the kids grow and he has struggled at times when I have given him the ‘Welcome Home Instructions’ on how to deal with our now nine year old little girls undesirable behaviour while he has been away. He is as much a part time Husband/Dad as I am a part time Wife/full time Mother (which on a bad day, I admit, becomes my badge of negativity). We have lost a lot of our social life as a couple and family as some friends don’t get it that sometimes we want to spend our time together and we can’t catch up EVERY time FD is in Qld. It is also hard to be part of couple groups when you are a part-time couple. In short we get on with our life and dream about the day when we are all in the same state and home together every night for dinner. I am lucky to be a fiercely independent and capable person (some may call it stubbornness) I am proud that I am able to keep the household running smoothly 95% oh ok 90% of the time and grateful that FD is the kind of guy who is able to make the best of it while he is away and embed himself back into home life when he is with us. I could not do what he does and he is freely admits he couldn’t do what I do. 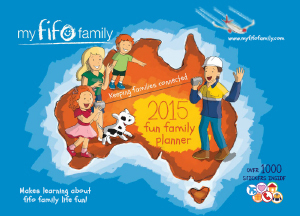 FIFO is outside the norm; it gets a bad rap, its lonely and takes a lot of sacrifice, not to the Gods of Wealth but of family time, social connections, Christmas together every year, birthdays, dance recitals, sports days, the list is endless. While we have had some highs and lows we are for the most of it a formidable team living a challenging lifestyle. FIFO for us has been the luckiest break in our lives, we have been able to buy our home and live a life that we are eternally grateful for. We will stick with it for a bit longer, maybe a lot longer but at least for as long as there are no cracks in our happiness or mental health that can’t be fixed with a hug and a cuppa.